I am still in shock that the office & craft room makeover is done, and for only $100! If you haven’t seen the whole space, you need to check it out here. Lot’s of my favorite budget decor ideas went into this one room. On the very last day, I was scrambling to add some decor to the walls. All the big pieces were done, but I needed a little character in the room. With a little creativity, and some old peanut butter jars, I made some DIY Wall Vases to add a little rustic charm and organization to my new space. To help save lots of money in the makeover, I decided to use my craft supplies as decor. On one wall I have a fancied up pegboard with lots of tools and supplies on it. Next to my desk I have paint storage shelves showing off my spray paint and craft paints. On another wall I have an ironing board and iron shelf that was prettied up to be a beautiful part of the room. But I had a little section of blank wall between my closet desk and the storage closet that also needed something. As I was organizing all my supplies, I pulled out a bin full of colorful art markers. Sadly, these have not been used a lot lately (I probably couldn’t have located them before even if I wanted to use them). These would be the perfect “art” for the empty little wall. I just needed to decide how to make them a beautiful part of the decor. Luckily for me, my family LOVES peanut butter. Seriously we empty a jar a week. And the two brands that I buy (Target brand and Adams brand) come in nice little glass jars. I never throw these jars away. Sometimes I even use them to store homemade sauces and salsas in the fridge. 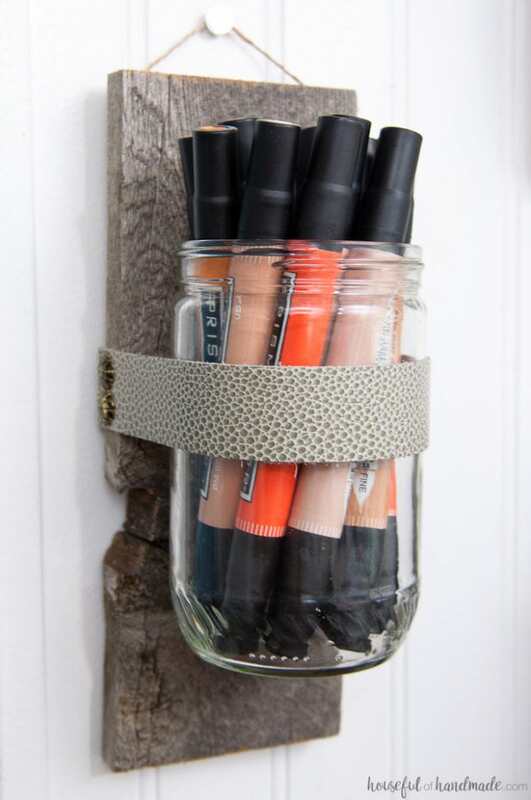 But this time, I upcycled these old peanut butter jars into beautiful DIY wall vases to hold my art markers. To give the DIY wall vases a rustic look, I used reclaimed wood for the back. This super fancy wood was pillaged from my parents old fence. If you are not lucky enough to have an old fence at your disposal, these vases would also be beautiful with pallet wood or even new wood with your favorite stain. Then I used leather left over from my succulent wreath to secure the vases. The result is the perfect balance of storage and decor. 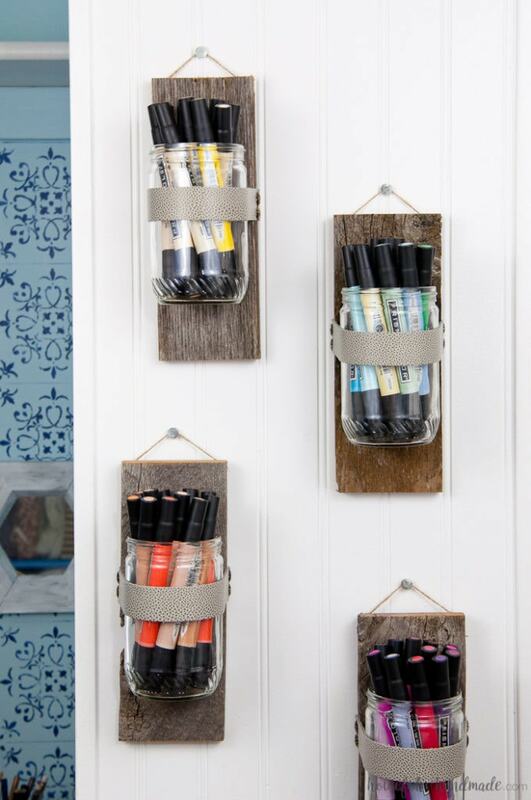 You can also use these easy DIY wall vases to hold non-craft supplies. How cute would they be in a dining room with your favorite flowers? Or even filled with dirt and growing herbs in your kitchen. And they are seriously super easy to make! I made all 5 of mine in just 20 minutes. So grab those old jars (hurry and eat a few more peanut butter sandwiches), and click the arrow below for the full tutorial. Love the wall vases. I am going to make some of these to give away as door prizes at our family reunion! Thanks for sharing. 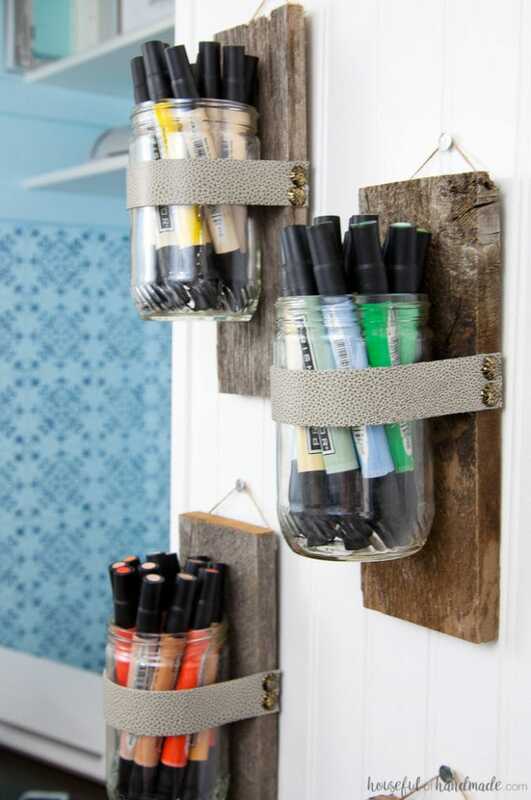 You did such a great job with these upcycled jars! I would love to use one photo, with a link back to your post, for a favorites post I am currently writing. Is this OK with you? 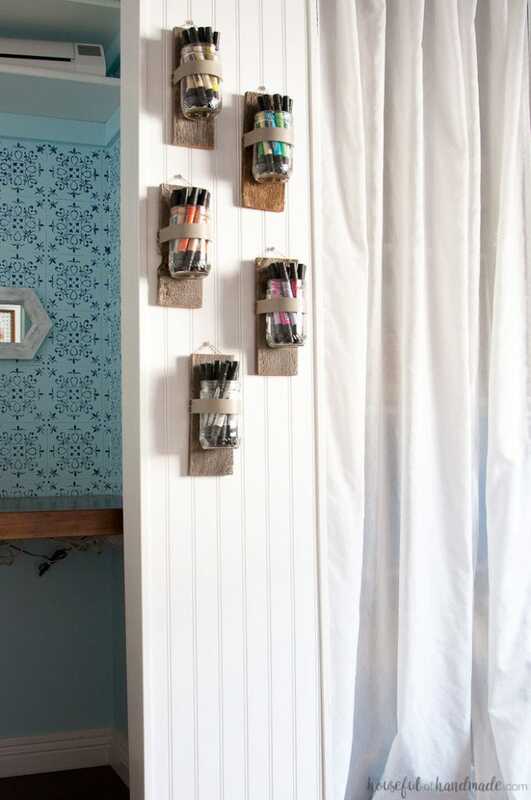 Bello trabajo y muy práctico para guardar implementos y mantenerlos organizados o simplemente para decorar los espacios del hogar.